The Panorama was one of the most successful attractions at the ‘64 Fair with millions enjoying what was billed as an indoor helicopter tour of New York. The nine minute ride provided a “god’s eye” view of the complex topography of the five boroughs and their waterways, allowing sightseers to view the City at sea level and from a simulated 20,000 foot elevation. The “helicopters,” molded plastic tracked cars that encircled the model, also came with a guided tour, “The City of Opportunity,” read by broadcast legend Lowell Thomas which you can listen to here. The ride was a bargain at 10 cents per person while the design and construction of the entire Panorama cost $672,662.69 in 1964, the equivalent of approximately $5 million today. The transcription of Thomas’ tour is below. Now look below you. The city of opportunity and of greatness, New York. More than eight hundred thousand buildings, millions of stories, bold and eloquent poems in concrete glass steel, soaring, stretching, bridges and towers reaching beyond expectation to record for all time the energy, thought and hope of man. Look at this map and you’ll locate the human race. This is as far as we’ve gone. A quick snapshot of our progress on Earth. By tomorrow, it will have changed. Far more than stone and glass, this turbulent city capital of the 20th century is energy. The cumulative force of 8 million people who daily inhabit its towers, walk, ride and play in its streets and give this city its meaning. A surging metropolis of 8 million masters with one incredible servant, the Municipal Government of the City of New York whose annual budget is larger than any of the 50 states, larger than most of the United Nations, who’s capital is also here, and how do you protect 8 million people? Prevent contagious disease? Educate a million children? Serve a million aged? Take care of the needy? Provide job opportunity? Leisure time opportunity? A good life, for all. An alarm in the night, from almost 300 fire stations the red lights flashing below. Engines, instantly on their way. One of a thousand fires a week, mainly in crowded districts where many people live. New York, 35 billion dollars worth of buildings. 8 million lives in the hands of twelve thousand dedicated officers and men. The fire department, largest in the world, working closely with the police, traffic, the courts and correction to make New York a safe place to live. Ninety percent of all fires are preventable, and ninety-five percent of its firemen teach prevention door to door, in the hospitals, on the beaches with the sound truck and in the schools. Six hundred elementary schools. The blue lights flashing below. Two hundred and fifty junior and senior high schools. The yellow lights. One and a quarter million students, and all deserve the finest education our town can provide. The three R’s are still basic, but students are also trained to think and make judgments to get along with others to have high moral and spiritual values. Today, the board of education faces difficult problems integrating children of different races. The teenager who drops out of school just when he needs more education to get a skilled job, but through the patience and hard work of their fifty thousand teachers, the city’s children daily receive a better understanding of their world and of themselves to make the best use of their own abilities. Eight hundred and fifty public schools, eleven city colleges, dozens of museums, over two hundred libraries. The city’s own radio and TV stations. All these together make New York one of the great centers of free public education for kindergarten kid or senior citizen. Educational opportunity for all. Every 3 minutes, another baby is born, a hundred and sixty five thousand every year, but even before arriving the new baby is a client of the department of health. The green lights flashing below. Maternity care, birth, infancy, nourishment to maternity, adulthood, old age. A lifetime of well being for 8 million people. This is the challenge and incredible achievement of the department of health. What does it take? In its laboratories and clinics, minute by minute vigilance. Examine and analyze the air we breathe, the food we eat, the water and milk we drink, the drugs we consume, the cosmetics we apply, the houses we live in, the waters of our beaches. Through 22 community health centers and its own research counsel and institute, the Department of Health stands guard together with the departments of sanitation, hospitals and public works and tries to solve this problem. Take a lifetime of well being and multiply it by 8 million. The answer, New York! The healthiest city of its size in the history of mankind. The social welfare investigator, one of the most difficult jobs in modern society, daily running the gamut of human want, inadequacy, suffering, need. The department of Welfare. The blue lights below. Its the largest single social welfare agency of its kind. It provides the necessities of life to those people in the city who can’t provide for themselves. Almost 60% of those receiving public aid are children under 18. Tragic aftermath of broken homes and unwed mothers and 20% more of those being helped are the aged poor. Welfare’s aim is to strengthen family life, protect the children and to restore as many as possible from dependency to self-support, helping each person realize his own potential. This is the commitment of a city to human worth and dignity. To the welfare of all. Marionettes, the park departments very own presented free to all the children of the city. A simple way to introduce theater to awakening minds and in 300 waiting pools, on 11 thousand swings, 3 thousand seesaws in more than 850 playgrounds. The white lights below. Every kind of game to strengthen young bodies, to get lively girls and boys to play according to their rules. Free concerts in the park, more than 300 each year make leisure time more rewarding for older folks too, and they get quite a kick out of seeing Shakespeare again superbly produced in the park, free. The dances, entertainment, big bands, but most of all, our senior citizens appreciate the golden age centers. Here they find new friends, learn new skills, try arts and crafts, or just enjoy small talk with a smiling companion instead of the loneliness and the erosion of old age. A new way of life. Through its department of parks, the city serves young and old alike, just as they serve the city. This then, is New York, far more than steel and concrete, the buildings and streets you see below are lines of force, pads of energy. The restless energy of 8 million people today, and millions earlier who together created and are creating this city. Here stretched before you is the cumulative effort of 300 years. Three hundred years of hope and daring of people of every nation, color and creed welcomed by one place of opportunity to live and work together. To make their private dreams come true. Here is the mark of our time. Man’s proudest achievement. Welcome to the city of New York. Now look below you. The city of opportunity and of greatness, New York. More than eight hundred thousand buildings, millions of stories, bold and eloquent poems in concrete glass steel, soaring, stretching bridges and towers reaching beyond expectation to record for all time the energy, thought and hope of man. Look at this map and you’ll locate the human race. This is as far as we’ve gone. A quick snapshot of our progress on Earth. By tomorrow, it will have changed. Far more than stone and glass, this turbulent city capital of the 20th century is energy. The cumulative force of 8 million people who daily inhabit its towers, walk, ride and play in its streets and give this city its meaning. A surging metropolis of 8 million masters with one incredible servant, the Municipal Government of the City of New York, whose annual budget is larger than any of the 50 states, larger than most of the United Nations, whose capital is also here, and how do you protect 8 million people? Prevent contagious disease? Educate a million children? Serve a million aged? Take care of the needy? Provide job opportunity? Leisure time opportunity? A good life. For all. Each year, more than four and a half million phone calls. People who want help and know they’ll get it from New York’s finest. Twenty-five thousand policemen, the largest municipal force in the world. The green lights flashing below, who safeguard life and property, apprehend criminals, uphold the law. Nine hundred thousand car calls bring around the clock patrols to stop crime, rush oxygen to a heart case or rescue a kitten stuck in a tree. This, all in a days work, and so are the 2 and a half million summonses issued each year. Keeping billions of legs and wheels briskly moving through 6 thousand miles of city streets. The police, New York’s finest, working closely with traffic, correction and the courts and with the fire department to provide personal security for the 8 million who live here and tens of millions more who freely visit. What chance do gifted children have when parents can’t afford to send them to college? Well, the city of New York extends the promise of free higher education, equal opportunity for all through its city university. The white lights flashing below. Eleven municipal colleges with more than 105 thousand students, the largest enrollment of any university in the USA. Its graduates have achieved distinction, from Beatrice Finkelstein, the girl who packed John Glenn’s lunchbox, to America’s elder statesman, Mr. Bernard Baruch. In the word of Mr. Baruch, “To this day, I retain a deep interest in the city colleges and I’m a firm supporter of free higher education. The municipal colleges have educated thousands of men and women who for financial reasons would’ve been denied the chance for college training.” Not only such notables as Senator Robert F. Wagner, Justice Felix Frankfurter, and Dr. Jonas Salt but thousand of less famous who are today playing constructive roles in every walk of life. The city university. Dozens of museums. Over 200 libraries. Municipal radio and TV. 850 public schools. Where can you find free public educational opportunities to equal New York’s? Every year, more than half a million persons receive the emergency ambulance care of the 22 municipal hospitals. The white lights flashing below. More than 3 million clinic visits a year. Part of this city’s belief that modern medical care is the right of every human being and New York is the greatest center of medical treatment and training anywhere in the USA. Carrying out the cities traditional role as port of entry for the poor, the department of Hospitals with its annual budget of a quarter of a billion dollars, treats all of those persons who can’t afford hospital care and thereby protects the public health. Through its departments of hospitals, health, sanitation and public works, the municipal government keeps New York the healthiest city of its size in the history of mankind. Why is New York a city of greatness? Worlds biggest port? Center of manufacturing, the arts and commerce? Finance, corporate headquarters of the UN? The answer is simple, look at its great natural harbor. Five hundred and seventy eight miles of protective waterfront, then the city is welcome to all people, regardless of origin, color or creed that come here to work and live. A city government able to provide for the incredible daily needs of 8 million people, the talents, goods and facilities required by business and industry. The city planning commissions spearheads urban renewal and guides the area’s growth. The office of the mayor, one of the most demanding executive positions on Earth. It administers the vast resources of the city’s command. It takes a lot to achieve greatness and even more to sustain it. 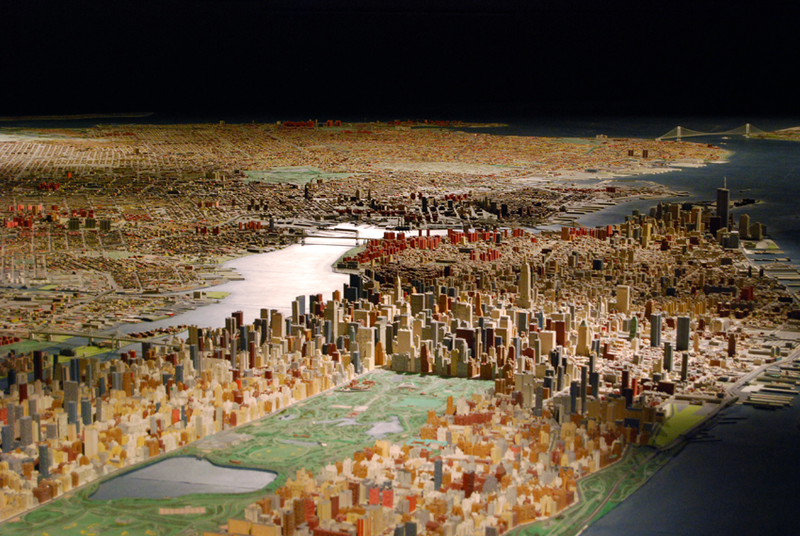 What would New York be like in the year two-thousand? It will be what today’s citizens and government make it. In this city of skyscrapers, preoccupied with business and trade. What if you like sports? Are there any? Are there any? Why, there are 3 archery ranges. Male voices: Well, there are 3 archery ranges,164 baseball diamonds. 936 basketball courts? 18 miles of bathing beaches. 50 miles of bicycle paths. 6 boat bases. 800 rowboats and 10 lakes. 74 [inaudible] courts, 47 [inaudible] pads, canoeing, 23 coasting areas for sleighs, chess and checkers, 18 cricket fields, 14 and a half miles of cross-country track courses. 2 croquet course, 37 fishing areas, 86 football fields, including 2 for Gaelic football, 12 golf courses, 1 golf driving range, 1 thousand [inaudible]. Male Narrator: Any sports in New York? Male voices: 14 hockey fields, 370 horse shoe pitching course, 279 ice skating areas, lacrosse, [inaudible], 18 model [inaudible]. Male narrator: Ask the department of parks. Male voices: [inaudible] 2 nature trails. 397 paddle tennis courts, 4 pony trails, 844 [inaudible], 2 riding academies, 78 roller hockey [inaudible], 116 rolling skating areas, 2 roller skating, one rugby [inaudible]. Male narrator: Any sport you can think of with all facilities. Some of the best in the world provided by the city through its department of parks, for all citizens to use and enjoy. Male voices: Oh, and 192 table tennis area, 69 swimming pools, 459 tennis courts, 311 volleyball courts, 281 waiting pools, water polo, weightlifting. Male narrator: This then is New York. Far more than steel and concrete, the buildings and streets you see below are lines of force, paths of energy. The restless energy of 8 million people today, and millions earlier who together created and are creating this city. Here stretched before you is the cumulative effort of 300 years. Three hundred years of hope and daring of people of every nation, color, and creed welcomed by one place of opportunity to live and work together. To make their private dreams come true. Here is the mark of our time. Man’s proudest achievement. Welcome to the city of New York. Now look below you. The city of opportunity and of greatness, New York. More than eight hundred thousand buildings, millions of stories, bold and eloquent poems in concrete glass steel, soaring, stretching, bridges and towers reaching beyond expectation to record for all time the energy, thought, and hope of man. Look at this map and you’ll locate the human race. This is as far as we’ve gone. A quick snapshot of our progress on Earth. By tomorrow, it will have changed. Far more than stone and glass, this turbulent city capital of the 20th century is energy. The cumulative force of 8 million people who daily inhabit its towers, walk, ride and play in its streets and give this city its meaning. A surging metropolis of 8 million masters with one incredible servant, the Municipal Government of the City of New York who’s annual budget is larger than any of the 50 states, larger than most of the United Nations, whose capital is also here, and how do you protect 8 million people? Prevent contagious disease? Educate a million children? Serve a million aged? Take care of the needy? Provide job opportunity? Leisure time opportunity? A good life, for all. In a city the size of New York, there are bound to be those who live and act outside the law. The social ills of a city reveal themselves in its courts. The white lights flashing below, and in its correction institutions. The yellow lights. The courts protect citizens by applying the law to everything, from minor traffic offenses, two to three million of these a year, to major crimes. The correction institutions work to safeguard society in the only meaningful way, by rehabilitating prisoners. They try to bring hope to men and women behind bars to destroy their cynicism, to give them self-respect and help them become useful citizens, for today’s prisoner will be our neighbor tomorrow. By preparing each one, our correction institutions safeguard all, it is this continuous effort of the courts and correction, the police, traffic and fire departments that helps make New York the safe place it is. If you want to get in touch with all the wisest men who ever lived, where would you go? Right, the library. For a library is nothing less than a giant switchboard where one mind can be put in touch with almost any other, and New York’s public library is the largest in the world. The red lights flashing below. It is central reference building and 185 local branches, more than eleven and a half million volumes are circulated each year. The most used library in the Western world. The central reference collection of four million volumes is a global treasure that speaks to its visitors in more than three thousand languages. Want to be in touch with George Washington? Well, you can read his farewell address in his own handwriting. The declaration of independence in Jefferson’s hand or the first Guttenberg bible brought to this country. A magnificent library where millions of New Yorkers are monthly in touch with some of the wisest men who ever lived. Together with 850 public schools, this city university, its radio and TV stations, dozens of museums, the public library helps make New York one of the great world centers of free public education. In the summer, it sounds like this and in the winter like this, but whether flushing the streets with water or removing tons of snow, it’s all part of the biggest housekeeping job on earth. The never-ending task of the sanitation department. The yellow lights flashing below. Sanitation, clearing 5 million tons of refuse annually, makes use of the largest incinerators in the world. Part of its physical plant, worth more than one and a quarter billion. But the biggest problem is people. How do you get them to be concerned about something they use and toss away? Handling 10 thousand tons of refuse daily, the department’s work is made a lot easier by this city citizens, who contribute to its vigorous campaign, just a drop in the basket helps keep New York clean. Sanitation, health, public works, hospitals. Four departments that together ensure the good health of all New Yorkers. New York is a city built by transportation. The red lights flashing below. First, the waterways, route to the early explorers and a way to the west. Today, five hundred and seventy-eight miles of developed waterfronts. Docks, handling more passengers, more cargo thank anywhere else on earth. All regulated by the department of Marine and Aviation, which also operates the biggest bargain ride in the entire world. The Staten Island ferry, still, only a nickel. Then came the railroads and subways. The transit authority, extended the city’s frontiers along its ever branching lines. Now, six million persons a day travel by subway and bus. A little system worth, two and three quarter billion. Then came the auto. On six thousand miles of city streets built and maintained by the department of highways. Each year, one hundred million cars and trucks move in to and leave the city via the six bridges and tunnels of the port of New York authority and more than 160 million people annually travel between the boroughs by the Triborough Bridge and Tunnel authority. Finally, the air age, from biplane to jet. Three major airports, La Guardia, Newark and Kennedy International, handling 17 and a half million passengers a year. Roaders and rails, wheels and wings, on land, in the sea, in the air. The greatest center of transportation on earth. New York. And sometimes, in the midst of all this energy, all the excitement and life of this metropolis, you just want to get away, and where do you go? Well, New York’s thought of that too. Through its department of parks, it maintains thirty five thousand five hundred acres of parkland. More than 17% of the total area of the city. Some of the world’s most valuable real estate just set aside for wildlife, green grass, trees and relaxation. Know how many trees in New York? Just 2 and half million. Know you can go bird watching? And you’ll see many rare species that you won’t see anywhere else, or just take it easy, lie down, relax. Perhaps near one of the lakes in Central Park. Eight hundred and forty green acres set right in the sight of soaring skyscrapers, or on a bright and sunny day, head for one of the beautiful beaches. Seventeen and a half miles of them. What a day to be alive! Doesn’t it feel great to be here now in the parklands, on the beaches in the city of New York? This then is New York, far more than steel and concrete. The buildings and street you see below are lines of force, pads of energy. The restless energy of 8 million people today, and millions earlier who together created and are creating this city. Here stretched before you is the cumulative effort of 300 years. Three hundred years of hope and daring of people of every nation, color, and creed welcomed by one place of opportunity to live and work together. To make their private dreams come true. Here is the mark of our time. Man’s proudest achievement. Welcome to the city of New York.